Dr. Harold A Woodcome Jr, MD is a Doctor primarily located in Providence, RI, with another office in North Kingstown, RI. He has 47 years of experience. His specialties include Ophthalmology. He speaks English. Dr. Woodcome has received 6 awards. The overall average patient rating of Dr. Harold A Woodcome Jr is Excellent. Dr. Harold A Woodcome Jr has been rated by 15 patients. From those 15 patients 3 of those left a comment along with their rating. The overall rating for Dr. Harold A Woodcome Jr is 5.0 of 5.0 stars. An awesome dr, inspires calm during an otherwise unsettleing event. Dr. Woodcome saved my vision! I suffered a detached Retina in my right eye and he saved most of my sight! I owe him a great deal of praise. He is a genius at retina surgery and a asset to the medical community. Very kind and compassionate he kept me positive before the surgery began. I was nervous but he told me I would be fine and I was. I would not recommend anyone else but him! Dr. Woodcome is an outstanding doctor. He explains everything in a way that is easy to understand. He talks to you before surgery and after and is available to talk if you have any problems or concerns. I had a detached retina and was very scared. He made a difficult situation bearable. His office staff are all friendly and concerned. They all made the nightmare of loss of sight in one eye much easier to cope with than it would have been otherwise. Dr. Woodcome gave me back a lot of the sight I had lost. I am so glad I was lucky that he was available when I needed emergency surgery!! 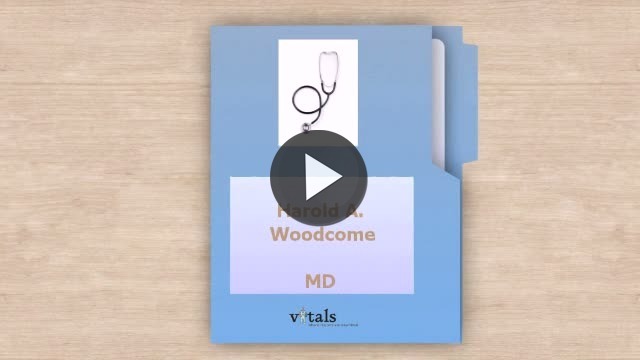 Take a minute to learn about Dr. Harold A Woodcome Jr, MD - Ophthalmology in Providence, RI, in this video. Dr. Harold A Woodcome Jr is similar to the following 4 Doctors near Providence, RI. Have you had a recent visit with Dr. Harold A Woodcome Jr? Select a star to let us know how it was.